Japanese restaurants in Washington DC tend to offer quiet spaces with modest interiors for enjoying mediocre raw fish rolled with overly sticky rice. Most often I get my sushi to go, passing on the humdrum atmosphere for the comfort of my sunken spot on the couch and the DVR. Kushi, a modern Japanese izakaya in Mt. 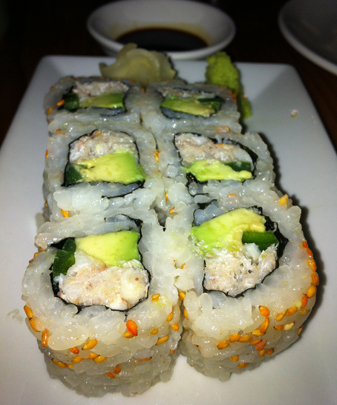 Vernon Square, defies the norm and breaths new energy into the DC sushi scene. The restaurant honors the spirit of a traditional izakaya, a place to share food, enjoy drinks, be social and stay awhile. That is just what Mr. Green Bean, Mr. and Mrs. Muffin and I intended to do on a recent Friday night. Entering Kushi is itself a transformative experience. After a set of doors, guests pass through a thick dark drape into a sleek, modern, upscale Asian tavern with an open grilling station in the center, a sushi bar and beverage bar to one side, and a casual dining room to the other side. The Aromas and heat from the grill envelope the rather spacious interior. Stools surrounding the grill offer an entertaining seating option for a party of two. But the Muffins are our entertainment for the evening and a four-top in the dining room served us well. A carafe of sake was soon on the table as I selected a porcelain cup from the basketful. Transport to a Japanese watering hole was now complete. 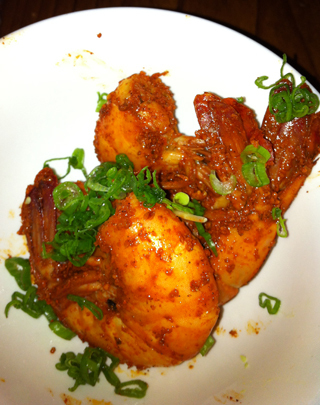 Kushi’s menu utilizes seasonal ingredients in a selection of small plates that change daily based on fresh offerings. I scanned through the listing of raw bar items, charcoal grilled skewers, wood grilled plates, and sushi to find many mouth watering options. The modern take on traditional Japanese cuisine lends itself to simple protein or vegetable based dishes, a la carte style. Yet, marinades and accouterments are still suspect for the glutie diner. Luckily, the servers at Kushi are prepared. Our energetic server couldn’t wait to bring me gluten-free tamari sauce. In broken up English he answered some of my questions and ran back and forth to the chef to double check several unknowns. A few of the menu items are gluten-free as they come, such as the Peel n Eat Shichimi Blue Shrimp, the Japanese Eggplant, and of course much of the sushi. Most of the other dishes, like the meat and seafood skewers, can be made sans-sauce. The tough part is deciding which dishes are the tastiest naked, and Kushi staff will tell you honestly. We started with the Peel n Eat Shrimp dredged in spicy shichimi spices that get under your fingernails as you strip the sizable pink meat from its shell. Wet towels are provided to wipe away the mess, making these flavorful critters worth the fuss. I ordered the Eringi Mushrooms, which, if I understood my waiter’s accent, are prepared normally without gluten. I love my mushrooms, especially when they’re wood grilled. However, the dish screamed for some seasoning, perhaps just a pinch of salt and garlic would have done it. 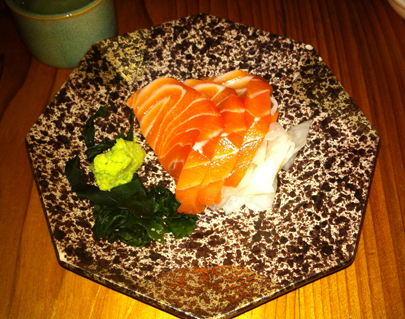 What did benefit from mild flavor was the buttery salmon sashimi, three generous pieces to a plate and all superb quality. My Spicy California roll with fresh lump crab meat & jalapeño was just as pleasing. I appreciated the use of actual crab meat (as opposed to gluten-containing fake crab) and jalapeño for the kick (rather than ambiguous “spicy sauce”). The server had the chef hold the tobiko for fear of some gluten containing marinade. Kushi’s rolls are perfectly bite-sized, not puffed-up with too much rice that falls apart at the touch of the chopsticks! Mr. and Mrs. Muffin enjoyed sashimi-style cobb salads that would have been my pick were it not for the glutenous dressing. The men ordered some simply cooked chicken skewers. Mrs. Muffin and Mr. Green Bean both tried the Chicken Teriyaki roll with avocado mayo. Due to his hatred of avocado, Mr. GB ordered the roll without the necessary mayo which resulted in it being bland and dry (Aside: Sometimes I really think I should just feed my husband blindfolded and tell him what he’s eating later). I benefitted from Mr. Muffin’s over ordering and enjoyed most of his Japanese Wood Grilled Eggplant topped with a sweet plum sauce that was surprisingly gluten-free. 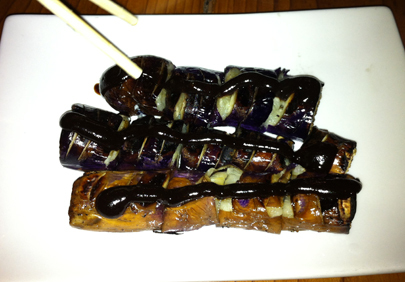 Between the melt-in-your-mouth eggplant and the sugary sauce, the dish qualified as dessert. Over another carafe of sake I concluded that the experience at Kushi is always a pleasant journey. The restaurant’s unique menu, high standards for quality ingredients and helpful service make up for some preparation missteps. Categories: 3 Spoons, Asian, Gluten-Free, Japanese, Seasonal, Small Plates, Sushi, Uncategorized, Washington DC | Permalink. another great one and yummy looking food. Still can’t understand the raw fish idea, but I know you enjoy it…hi to Mr. GB and the Muffins!